I came across an old box of photos from a long time ago. Below is a little sample. Many of the stirred long forgotten memories. Over the years there have literally thousands of builders we have worked with, and I am pretty sure I have actually touched more than 1,000 Corvair engines destined for planes, met their builders, worked with them. I have run 400 or so engines on our test stand. Sounds like a lot, but the work dates back all the way to 1989. The most common ‘complaint’ about Corvairs from people, who have frequently never met me, is that I must have some giant ego. I am not sure how these people missed the fact I am a self described Grease monkey-troglodyte. My success with Corvairs isn’t because I am so smart, it is actually because I have always been just dumb enough not to know when to quit. The progress was made, not by brilliant insight, but more often by exhausting the permutations of what wouldn’t work, and being very observant of all of the information available, not just the small fraction that served a pet theory. Ironically, many of the these critics are the same who need to believe that in their first Corvair engine they have discovered something that eluded detection by myself and all the builders that came with us. That is arguably the very egomania they desperately need to ‘expose’ in others. Enjoy a look into the long past, to see some of the milestones of 27 years of work. I have outlasted nearly all of the alternative engine companies of the last decades. There are a number of skilled, experienced builders, but few who have been continuously at it without break, attending airshows in person from coast to coast. It isn’t a contest, but it is a fair reminder that I am still here and I have left a long trail of compulsive critics in the rear view mirror. 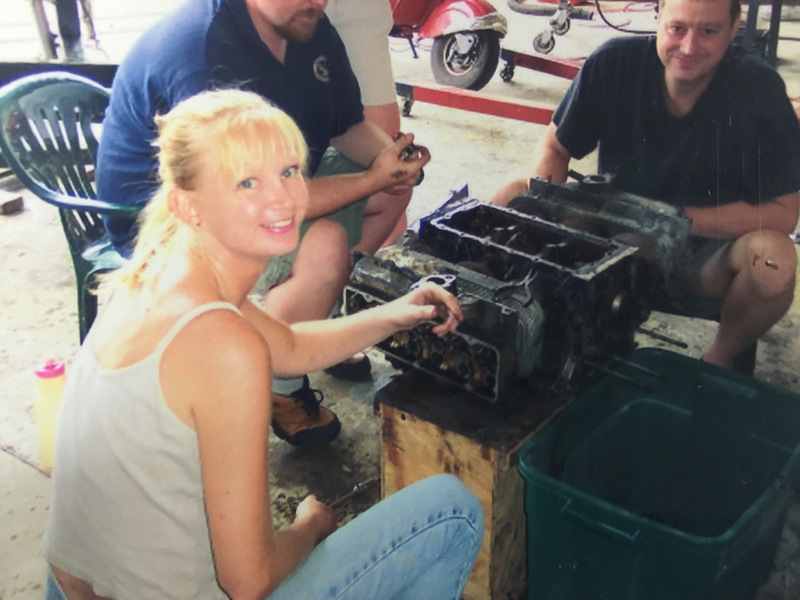 Above, Grace takes apart a core engine at Corvair College #3 at Spruce Creek Florida, 2002. With her is Gus Warren and Mark Christmann. 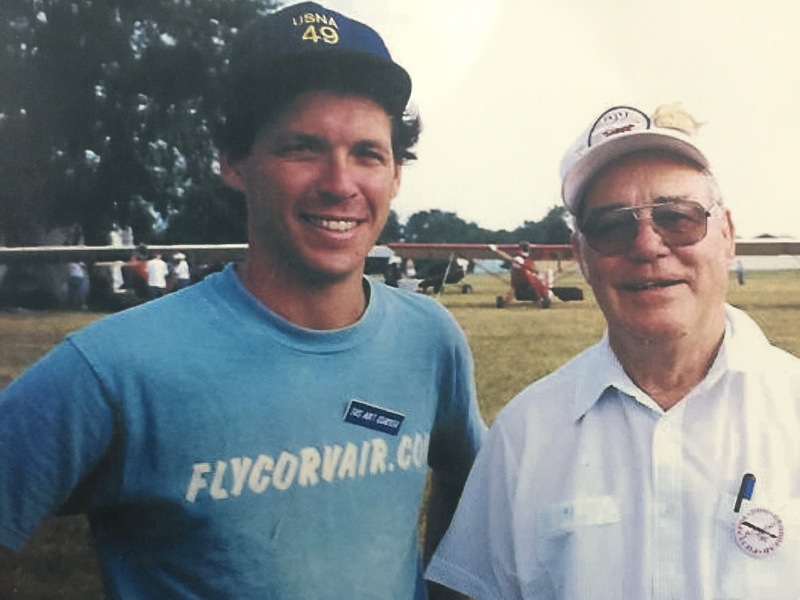 Above, two eras of Corvair advocates: Left is Bud Rinker, right is a young version of me at Sun n Fun 1995. Bud developed his ‘Rinker Gearbox’ in the late 1960’s. It worked, but he never personally flew it. His two practical articles with data in 1970 issues of Sport Aviation was actually a great contribution, and provided turbo data we later built on. Bud perished in a car accident about 10 years ago. 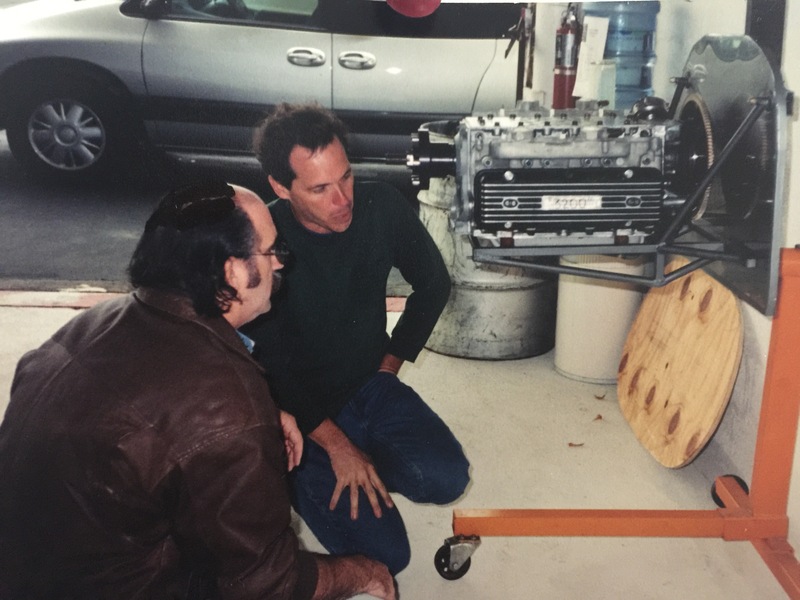 Above, before there was gray hair: Pat Panzera and myself looking at the first Dragonfly / Corvair engine mount I built, 1999 or 2000 at the tandem wing fly in in Kansas. Above, Myself and Virl Deal at Brodhead 2000. 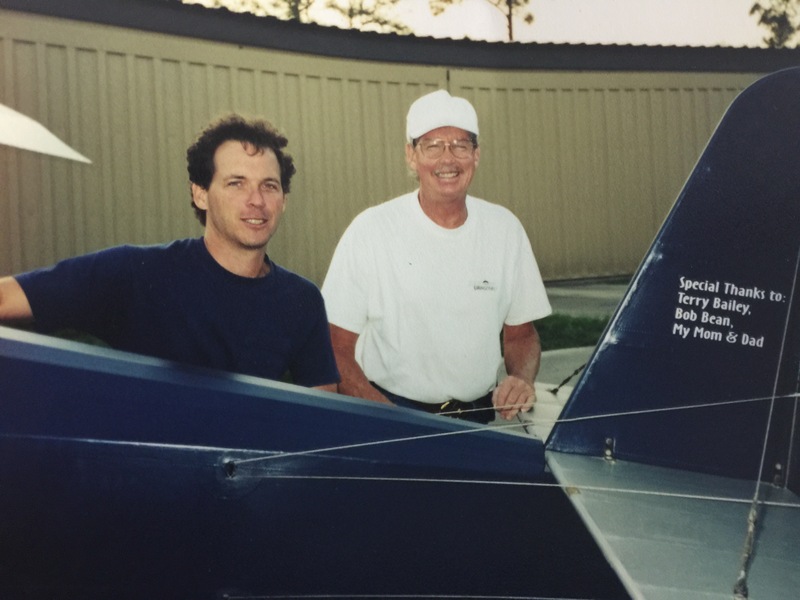 Virl logged 1,100 hours on his Corvair powered Pietenpol over a 15 year period. 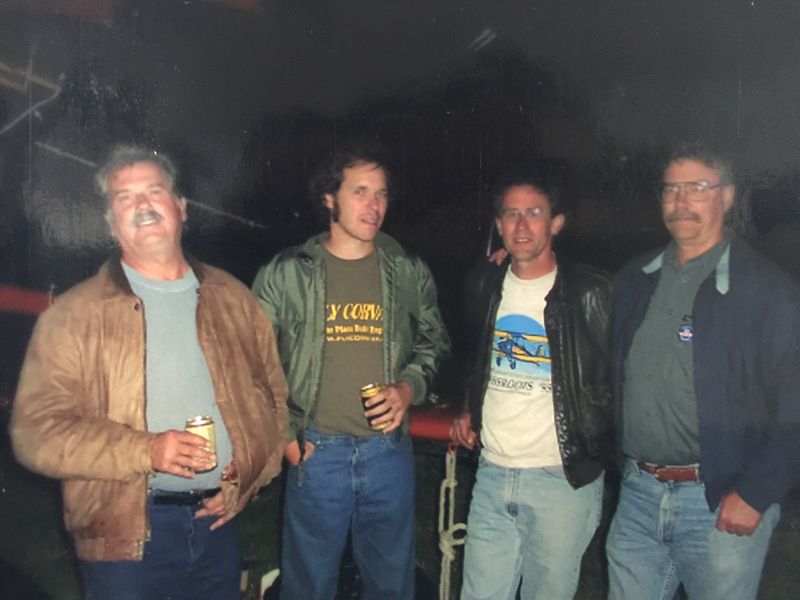 The button I am wearing says “This ain’t Oshkosh” a then popular Brodhead motto. I am wearing my father’s hat. Above, something different, flying an hour of jet aerobatics in Heintz Peier’s L-39 Albatross. 1993. My work has crossed my path with that of many interesting characters. Heintz was from Switzerland, but lived at Spruce Creek. My years at Embry-Riddle and this kind of exposure gave me a lot ‘bigger picture’ than most alternative engine guys. Many people like to talk about “pulling G’s” but most light planes have a lot of drag for their energy. Conversely, the L-39 can sustain 5 g’s for 20 seconds without bleeding off all the energy. It was the limit of what I could take at age 30. 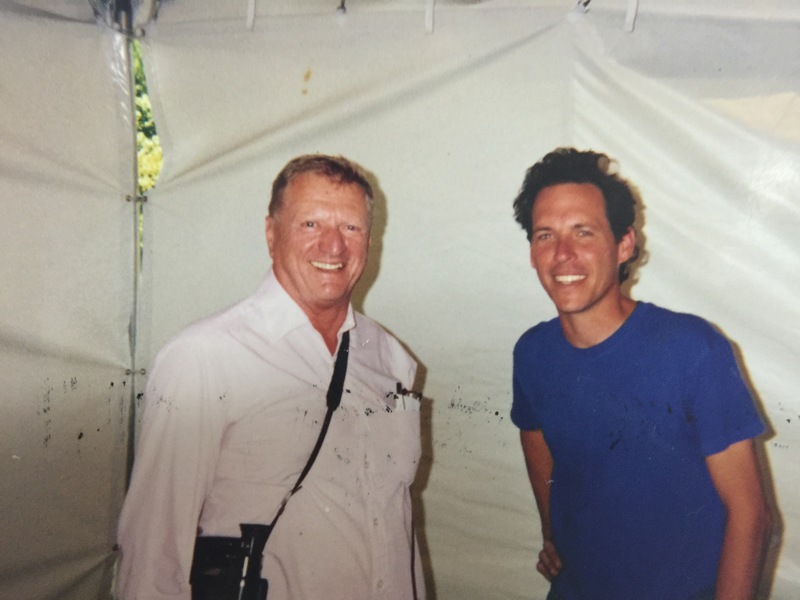 Above, myself and the illustrious Terry Bailey of alto mud creek GA, 1999. Terry was a character from the world of tandem wing planes. The tail of my Pietenpol expresses thanks to people who believed in what I was doing. Bob Bean was the finest person I ever met in aviation, you can see his picture here: Risk Management reference page, he and his wife Sara perished in a weather related Glass air accident in 2006. Above, Jake Jaks and myself, at the conclusion of Corvair College #1, in May of 2000. Jake went on to fly this engine in his Pober Jr Ace. In 2009 he flew it to Sun n Fun and was greeted by the designer and founder of the EAA. Read the story here: http://www.flycorvair.com/snf2009.html . Above, At Paul Poberezney’s SAA fly in at Frasca Field IL, 2003. I am in the green jacket with muttonchops. Grace was the first guest speaker at the fly in that year. In the black jacket is Tom Brown, who’s 1,600 hours in his Pietenpol makes him the worlds highest time Corvair pilot. In the blue jacket is Bill Knight who owns B.H. Pietenpol’s “Last Original”, Bernard’s last plane which lives and flies out of Brodhead. 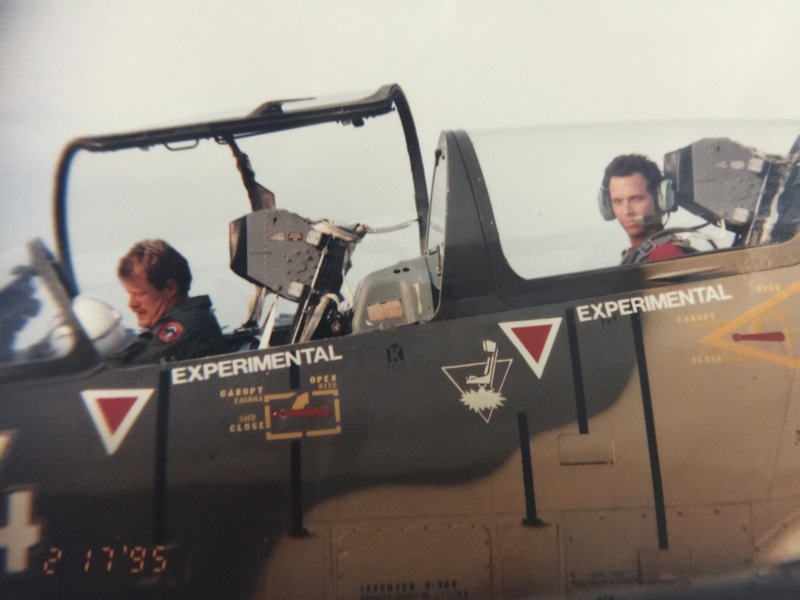 We are standing in from of Bill’s Waco F-2 replica, which was hand built by Tom. 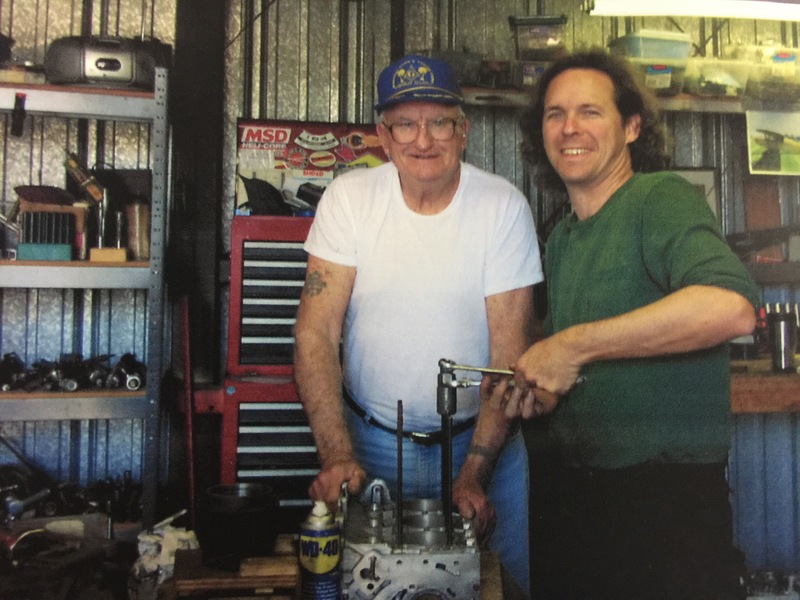 Above, In my shop with WWII veteran and builder of 8 experimental aircraft, the late Steve Magill of Florida. 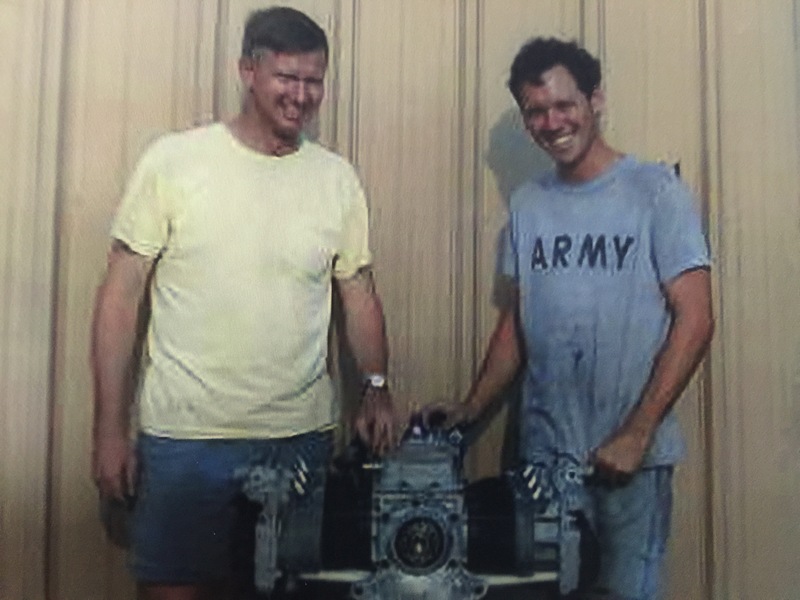 The engine seen here later flew on Steve’s Pietenpol. Take a few minutes to read Steve’s story here: Four Men. Steve was a Landing Craft Coxswain on D-Day. He wanted me to know me how bad that day was, but he just couldn’t put it in words. He said several times “They were just boys” and “It was murder.” He said that leaving those men on the beach was the worst moment of his life, and it never went away. Grace and I never charged Steve a dime for all the assistance putting his engine together and running it. Most good businessmen wouldn’t ‘waste time’ on a guy with a thin wallet like Steve. That is their loss, they can live in a shallow world worshiping dollars if they choose. For myself, the hours we shared with builders, particularly the ones of Steve’s generation, were their own reward. This is a concept that the compulsively critical fail to understand. We have now held 38 Corvair Colleges, and we have never charged anyone for all the things we offered to share at the events. It wasn’t charity, it was an expression of gratitude for men like this: ERAU – models of integrity #2, who took the time to freely share with me knowledge they had learned, some of it at a very steep price. We all live in worlds of our own making, and looking back on the photos gives some satisfaction that I chose to put something positive back in Experimental Aviation, it is small thanks for all that it has brought to my life. Mr. Wynne, just a note on Jakes engine. It’s still pulling the Junior Ace into the air. I have changed the head gaskets on the left head but other than that; just tune ups. It runs great and makes excellent horsepower. Everyone is impressed by the engine and airplane. Keep up the good work and thanks for being the Corvair guru!